Whether you are here to explore the natural beauty of the Cape Range National Park, snorkel with whale sharks or humpbacks, catch a red emperor, tag a marlin or to just relax on the beach, Mantarays Ningaloo Beach Resort is the perfect place to begin and end your day. 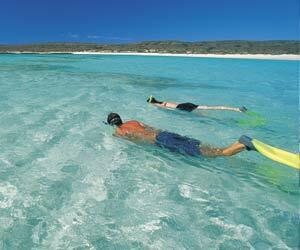 World Heritage - listed Ningaloo Marine Park - Snorkel/dive on the reef just metres from the waterline or just relax on the white sandy beaches. Turquoise Bay -Turquoise drift dive, Bundegi or Oyster Stacks to name a few. Exmouth Navy Pier - The Pier has been rated as one of the top ten dive sites in Australia and one of the top ten Pier dives in the world. It has a world-wide reputation for its amazing range of sea creatures. Lighthouse Bay, West Side, Muiron Islands are just some of dive sites. Shothole Canyon (turnoff) (12km) - Self drive the base of the Canyon 2WD/4WD. Jurabi Turtle Centre (20km) - Learn about turtles at the Interpretative Centre (Mating/nesting season November – March). Charles Knife Gorge (turnoff) (21km) - Self drive the ridge of the Gorge 2WD/4WD. A variety of local tours and attractions.